If you knew me back in the day -- like mid-90s back in the day -- you would know that pretty much the entirety of my fannish life revolved around The X-Files. I had an "I Want to Believe" poster in my bedroom. I raced my friends to the door of the theater so I could secure the very first ticket to the very first showing of the X-Files movie. I desperately wanted Scully-red hair. (I never got it, but I still to this day have the temptation to go that red, just for the fun of it.) To this day, I still have a weird, lingering desire to be an FBI agent, and I'm sure it's because of spending my formative years watching a couple of fake agents on the TV. So, it's been a great pleasure to see Gillian Anderson continue to pop up in movies and TV over the years, particularly her delightful turn on Hannibal (if you want to shout about Hannibal and how great it is, come find me, let's talk, I love it). And then when I found out she was writing a book, well, hold on to your pants. I might have made a screeching noise and threw myself at the internet until the book landed in my lap. A Vision of Fire has already been generating some good buzz, but, let's be honest, my favorite review comes from Flavorwire, which says: "This is basically the dream of nerds everywhere." You're totally right, fellow nerd. 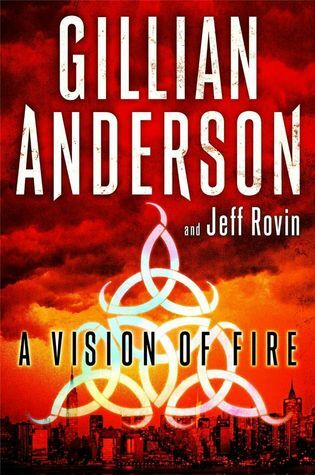 Thanks to the generous folks at Simon & Schuster, I'm pleased to be able to offer a copy of A Vision of Fire for giveaway to one lucky reader in the US! Enter the rafflecopter below for your chance to win. Gillian Anderson is an award-winning film, television, and theatre actress whose credits include the roles of Special Agent Dana Scully in the long-running and critically acclaimed drama series, The X-Files, ill-fated socialite Lily Bart in The House of Mirth, and Lady Dedlock in the BBC production of Charles Dickens’s Bleak House. She is currently playing the role of Dr. Bedelia Du Maurier in Hannibal and is a costar on the television thriller, Crisis. She currently lives in the UK with her daughter and two sons. I hope this book is as good as it sounds.